The newest (and longest, barely) of the super-minis is the 104 mm M601 (auto battery) and M602 (manual battery). 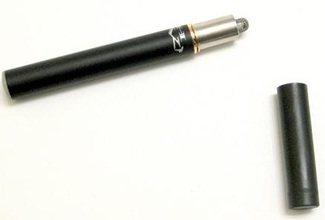 It is carried by Electronic-Cigz ($60) in Canada. I know little about this model myself, but, according to the video reviewers, it appears to be one of the best of the super-minis and comparable in performance to the minis. A PCC is available for the M601 for $30 from Electronic-Cigz (but it will not accommodate the manual switch button of the M602, despite the one shown in this photo). It holds up to two batteries, 4 carts and/or atomizers and charges one of the batteries. For more information on the M601/602, check out igetcha69‘s and MoobyGhost‘s video reviews, crippledbazooka’s M601/602 ECF thread, and the Electronic-Cigz forum on ECF. For more information, explore ECF’s RN 4081 *Super Mini* model-specific sub-forum. smokingtwopointoh demonstrates the SmokeStik Royale-branded RN4081. There now is also a cartomizer version of the RN4081, called the Double Deuce ($44) by Good Prophets, which also sells the standard RN4081 atomizer. The same-sized 103 mm DSE103 is not that common a model. Its atomizer and battery are fully compatible with the above RN4081, but the 103’s atty is exposed (good for dipping). The cartridges are not compatible, however. 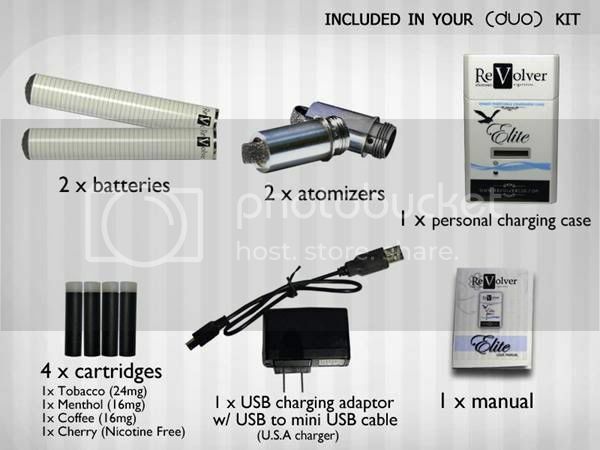 U.S. suppliers include Domestic Vapor ($20), The House of Vapor ($43) and eLiquidPlanet (which calls it the Solar Flare, $70, 10% discount code: VGELP10); and, in China, Heaven Gifts. BestEcig’s BE103 is virtually identical ($28, China). The 98 mm Joye306 ($44 from Rocky Mountain Vapor and $50 from TrueSmoker, each with two atomizers) and M402 ($43 from LiteCigUSA) are both well-regarded models. [See also our news story about “The Hottest ‘New’ Atty“.] The Joye306 is compatible with the smaller Joye306a and larger Joye510 and eGO*; the M402 is compatible with the M403 and M401. * Clarification: The 306/306a atomizer works with the 510 and eGO batteries and the 306 battery works with 510 accessories (the 306a described next is too small for the 510’s PCC), but the 510 model has its own, different atomizer. Shown above are the Joye306 and the M400 series (with the M402 highlighted) with their respective exposed wick atomizers. 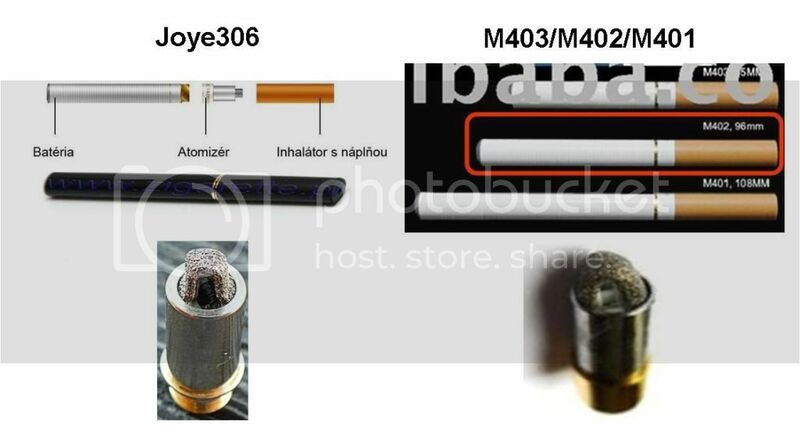 Notice that they are virtually identical in appearance (but not compatible with each other); although alibaba.com (whose imprint is blocking the top M403 model) claims that the M402 is 96 mm. 96 … 98: big deal! I couldn’t find a Joye306/306a/510 photo comparable to the M400 series photo, but I did find that above left component-breakdown picture with annotations (in Czechoslovakian, I believe). Know, however, that the Joye306/306a/510 size comparisons are similar to their Smoore* counterparts. If you want an e-cig close in size to a 100s analog, get either of these. Of the two, I suggest the 306, because of its compatibility with those immensely popular models … and see the “Breaking News” about the 306 atomizer. Explore the respective ECF Joye 306 and M-401/402 “Mini” & M403 Super Mini model-specific sub-forums. If you want an e-cig close in size to a king-sized analog, get either of these (but puffs per battery charge are less than their 98 mm brothers). [You might want to purchase a 98 mm starting kit and an extra battery for the 89 mm size.] 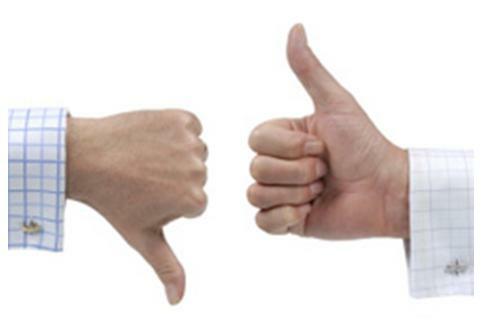 Both are available in black or white. You saw a photo of the M403 at the top of the above group photo. Shown below is the Joye306a. The 88 mm blu is a beautifully branded L88, as is the Hawaii-based Volcano. They’re sold with their own PCC for $60. Read user comments in ECF’s Blu Electronic Cigarettes Model Specific Discussion sub-forum and decide for yourself about these L88s. The 86 mm M702 ($34 for a one-battery/atty kit from China-based AbsolutelyEcigs; and $60 for a two-battery/atty “Elite”-branded kit from Revolver) is a newer Smoore model. 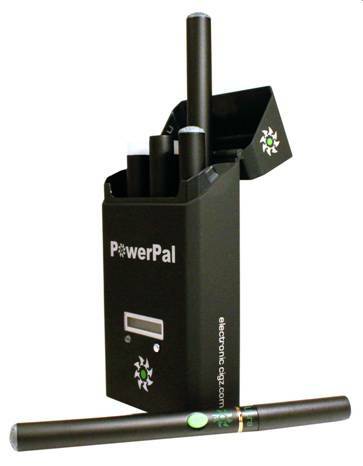 The starter kits include a PCC that holds an assembled e-cig (in addition to the battery being charged), plus four extra cartridges. Batteries and cartridges are available in white and/or black (although Revolver also offers a chrome battery and blue or tan cartridges). As you will see from Nicco Daniels’ high-energy video review (and accompanying ECF thread) of the e-cig and its PCC, he is very enthusiastic about this product. 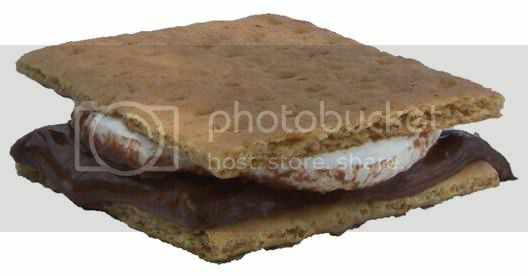 As you can see in the pair of photos on the left, the wick is exposed. On the right is the 084 lined up next to the blu.